Project RENEW’s key staff and trainees from other Vietnamese organizations pose for a photo during their participation in a Fundraising and External Relations training course in Hanoi offered by USAID. Photo by USAID’s PCD, 30 May 2018. 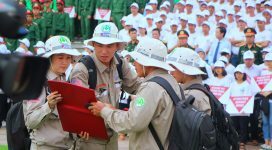 Dong Ha, Quang Tri (17 January 2019) – Project RENEW is one of the eight Vietnamese organizations selected to participate in a holistic training program designed and implemented by USAID/Vietnam Partner Capacity Development (PCD) Program. At the end of the intensive three-day Organizational Monitoring & Evaluation course in Nov 2018, the Project RENEW participants were informed that they had successfully completed the training program titled “Organizational Development Trail” (ODT). 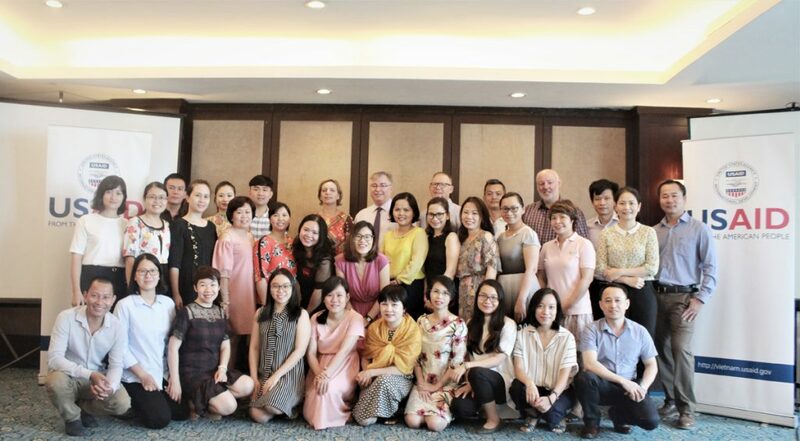 Held in Hanoi over a span of one year, from December 2017 to November 2018, USAID’s ODT consisted of seven training modules and three leadership forums aimed at strengthening the human and institutional capacity of Vietnamese non-governmental organizations. As one of the organizations that work to support war victims and other persons with disabilities in Quang Tri Province, Project RENEW had been invited to take part in the ODT training series. The training covered Governance and Strategic Planning, Leadership and People Management, Fundraising and External Relations, Project Design and Management, Human Resource Management, Financial Management, and Organizational Monitoring and Evaluation. 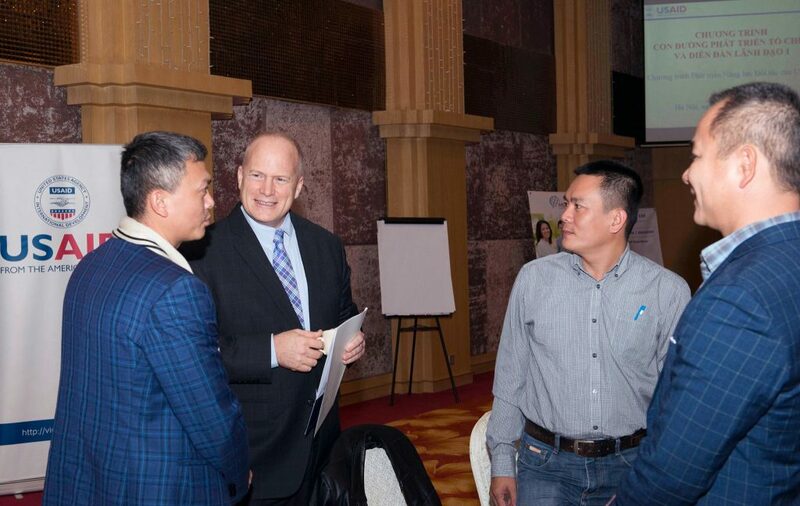 USAID/Vietnam Deputy Mission Director Craig Hart talking with Project RENEW staff during the launch of the ODT program in Hanoi. 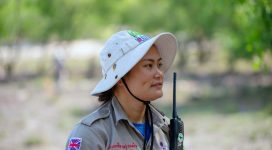 Photo by USAID/Vietnam, 13 December 2017. 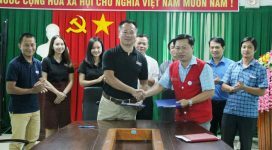 “This participation in the ODT has been a valuable opportunity for our Project RENEW team to improve our management capacity for long-term development,” said Nguyen Hieu Trung, Project RENEW Coordination Manager. Trung noted that Project RENEW is planning to seek USAID funding to bring support to the homes of severely disabled persons in Quang Tri Province. 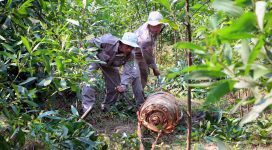 Straddling the former Demilitarized Zone, Quang Tri Province was heavily bombed and shelled during the American War and now remains heavily contaminated with Unexploded Ordnance (UXO). It was also subject to defoliant spraying missions conducted by the U.S. military, ranking 9th among 58 provinces sprayed with Agent Orange (AO) and other herbicides, according to a study by the Aspen Institute. Out of 37,000 disabled persons, about 15,000 people suffer severe or very severe disabilities.